Meteorites are over a billion years old and have survived a journey to Earth from outer space! Originating as a solid piece of debris typically from an asteroid or a comet, a Meteorite ring makes a one-of-a-kind masterpiece - truly eye-catching and stunning. 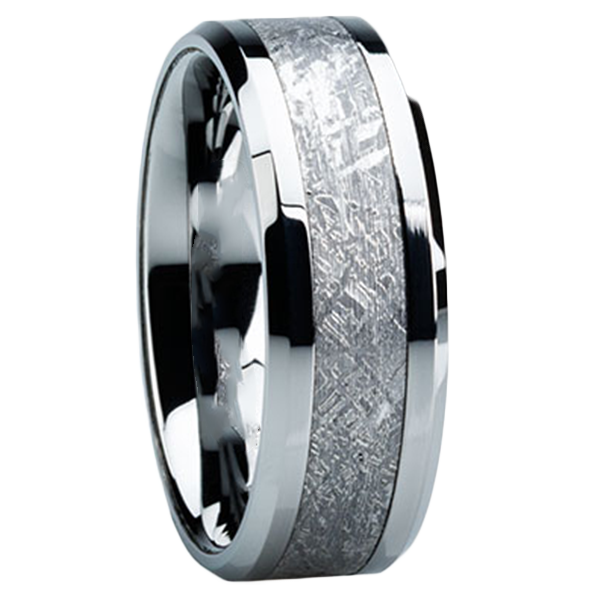 Most of our rings are made from Gibeon Meteorite because of its unique pattern and finish. The elegant H119M featured above is one of our most popular styles in the Meteorite Collection (available in Titanium or Tungsten). In authentic Meteorite rings you will often see Troilite etchings which are dark spots called "Meteorite Fingerprints" (pictured above); these appear randomly among a Meteorite's metal patterns, caused by hurling through space sometimes approaching millions of degrees as they approach the sun! These Troilites are not defects but are signs of authenticity and are a unique aspect of the history and origin of Meteorites. To view our entire Meteorite Collection please click HERE.